Have you noticed more planes flying overhead in your community that leave trails behind them in the sky? Apparently these patterns are the result of “weather modification” programs — also referred to as “solar radiation management” or “chemtrails”. The international program involves spraying aluminum, barium, strontium and other toxic chemicals from airplanes at high altitudes that then fall to the ground, ending up in our bodies, our water, our soil and the air we breathe. Thank you to GeoEngineering Watch, Chemtrails 911, Space Weather, SkyderAlert, Barry Kolsky, Michael Murphy, Rob Leslie, Ray Gale, truthseeker1922 and Skull for chemtrail footage that helped make this video possible. When my kids were little, I used to read to them from Alice in Wonderland and I remember we learned that the Mad-Hatter was “mad” because it represented hatters of the time in that, apparently, the guys who made hats used mercury to turn the fur into felt and they would breathe the mercury and it would cause brain damage and, hence, the “mad hatter”. That was in the ’70s and ’80s that I had my young kids and, at the same time, I was learning we were supposed to avoid using aluminum pots and pans because there was apparently a connection to autism. That was the first time for me that I made any connection between heavy metals and human health. And then, a few years ago, I learned that there was an unnatural amount of aluminum in the soil and that there was a program spraying aluminum and other heavy metals up into the atmosphere and so I wanted to check it out. That’s the first way that chemtrails showed up for me. Basically, chemtrails is a geo-engineering program where airplanes fly at high altitudes and they spray chemicals into the atmosphere (including aluminum, barium, and strontium) and then, those metals fall to the ground and they land in our bodies, on the soil, in our trees, in our food, and in our water. Many people confuse chemtrails with the normal jet contrails. The difference is that the normal jet contrails actually dissipate within minutes while the heavy metals in the chemtrails cause those trails to persist for hours. It’s not a hypothetical thing. There are 32 states that already have legislation that’s related to weather modification. The U.S. agencies that are documented to be involved in it include the U.S. Air Force, the National Oceanic & Atmospheric Administration (NOAA), the U.S. Department of the Interior, the National Science Foundation, and I know China boasted about using cloud seeding and weather changing before the 2008 Olympics in order to keep the opening ceremony dry. That this is happening is completely documented, it’s just that you have to know where to look because it’s not talked about on mainstream weather reports. This is where it gets controversial and it’s kind of weird because even though it’s factual that there are metals in the atmosphere and factual that those metals are falling to the ground, when you acknowledge that or question the legitimacy or the legality or the safety or the morality, it becomes controversial. That’s sad because if you’re questioning something that has such a major impact on us and on future generations and on our planet, it seems to me that it should be one of the most natural and encouraged parts of life and education. So, if you’re not educated about this issue, I encourage you to do some basic research and I’ve put some links at the bottom of this blog to help make that easy. I personally don’t know anybody who is informed who isn’t concerned, although the range of concerns is vast. For some, it might be that they think this is a benevolent weather modification program like putting snow on ski slopes in a bad season, but that it’s inadvertently having some negative health impacts. Somebody else might think that the so-called “solar radiation management” is backfiring because the supposed idea is that you blanket the sky with these heavy metals and it reflects the sun back to itself. However, it’s also creating a blanket and trapping the heat in and so they are concerned about that. Somebody else might think that it’s a corporate agenda to get an upper hand on commodities trading by being able to control and, therefore, predict the weather (and when you realize that 80% of the global economy is impacted by weather, that would certainly give someone an upper hand). Somebody else might just think it’s a very sinister plan to sicken people and further control our food supply. The point is that there are any number of concerns, no matter what belief system motivates you and that’s significant because I think it both validates the range of dangers and, at the same time, it informs what we can do about it because even for those of us who are convinced that we have a problem, our motivations and concerns vary and that means that our strategies for engagement also have to vary. So, if you want to get engaged in this issue (and I hope you do), I recommend that you first identify what part of this most concerns you, what is your particular passion, because what we notice is that if each of us is doing the part that we’re most naturally passionate about, we can sustain our efforts, we don’t burn out, and it turns out somebody else wants to do a part that you don’t want to do. You can check that out at thrivemovement.com on the Solutions Hub. There are tools there to explore what other people are doing and, also, to explore your own purpose and passion. Currently, at thrivemovement.com, we’re getting the money and the infrastructure together to create a more enhanced Solutions Hub that’s going to make it easier to share best practices globally, to share data and strategies and successes in order to really pull this together and focus on this issue effectively. 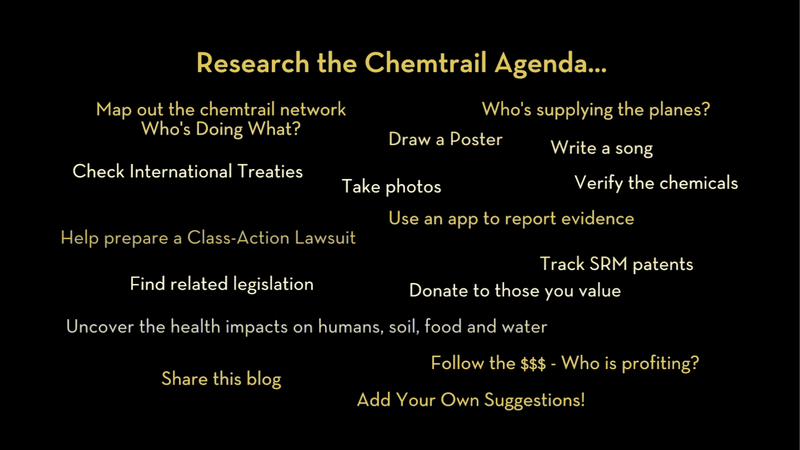 Meanwhile, you can go to the Solutions Hub, you can find if there’s a group in your area working on chemtrails (I went yesterday and there were over 60 devoted to this issue) and you can be doing the homework that we’re going to need to have be done when we launch what we’re going to do, a global webinar, taking on this issue that really shows how to do whole systems problem-solving so that you’re doing your part, someone else is doing their part, and it turns out that all the Sectors are covered. You could map out the whole chemtrails network and see who’s doing what. What companies are supplying the planes? What chemicals have been identified? What kind of related legislation is there? Who’s got the patents on the solar radiation management? You could check out the health impacts on humans, on the soil, on food, on water. You could unpack the futures forecasting and commodities trading and figure out who’s winning in that market and do they have any connections to the planes or to the chemicals. You could look into what treaties address international toxic spraying. You could draw a poster that would help highlight the issue. You could write a song, like Skull did. If you have a high-powered camera, take pictures. You can share the app at the bottom of this blog. If you’re a lawyer, figure out what we’re going to be needing for a class action lawsuit. You can contribute money to the people and organizations whose work you most value in this. You can share this blog. You can add to the list and post it. The point is there’s something that you can do that we need done. I’m confident that we can stop chemtrails. We need to get informed. We need to communicate and coordinate with each other. We need to be organized. And, we need to act effectively. We’re going to do what we can at thrivemovement.com to facilitate that and, in the meantime, do whatever it is that concerns you most. It doesn’t matter how much that’s different from what concerns somebody else. It’s that we’re all concerned that unites us. So, do your part, share what you learn, and keep looking up. Who in the World Is Spraying? 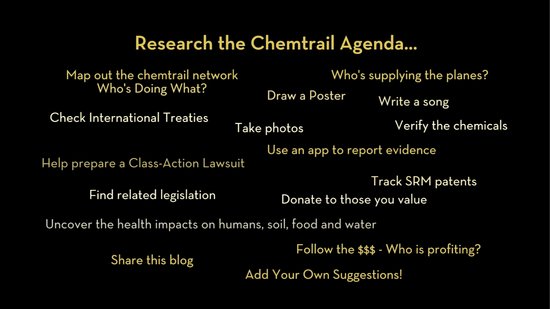 Join in the Global March Against Chemtrails and Geoengineering on August 25, 2013!